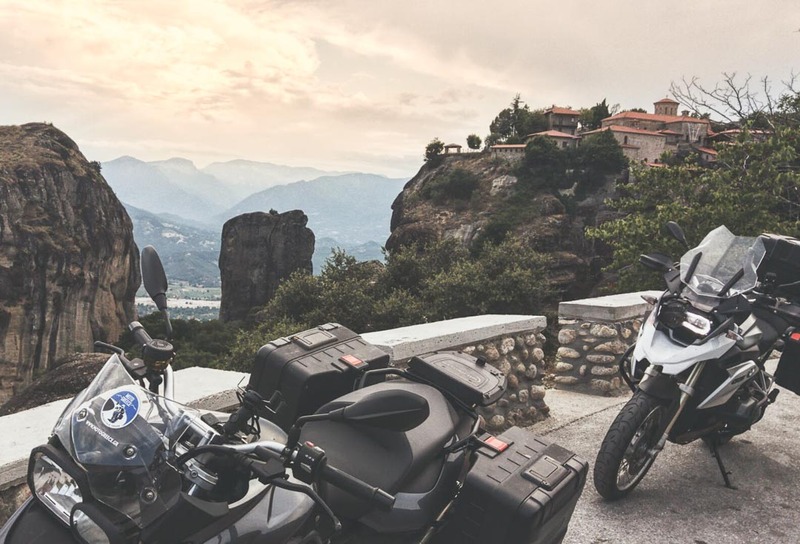 The “Central and Northwest Greece Motorcycle Tour” aims to show you some of the country’s less visited places which are, from a rider’s point of view, simply amazing. You have to ask yourself. What are the elements that make a ride in the countryside unforgettable? Stunning landscapes? Check! 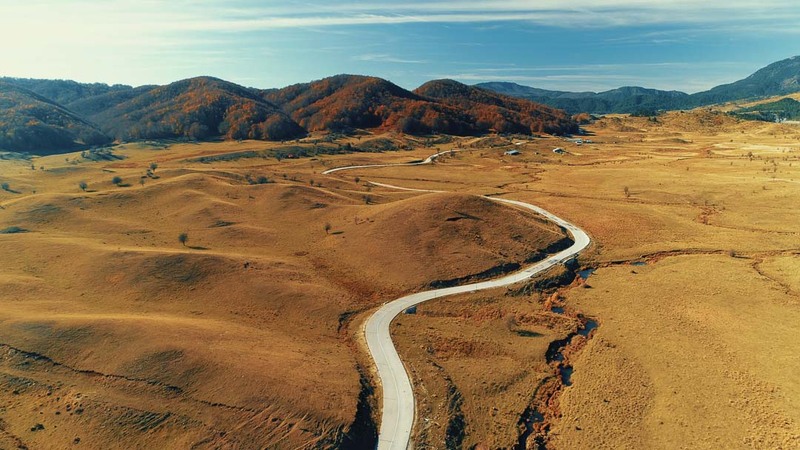 Roads with consecutive bends & corners that seem to never end? Check! Little to none traffic? Check! 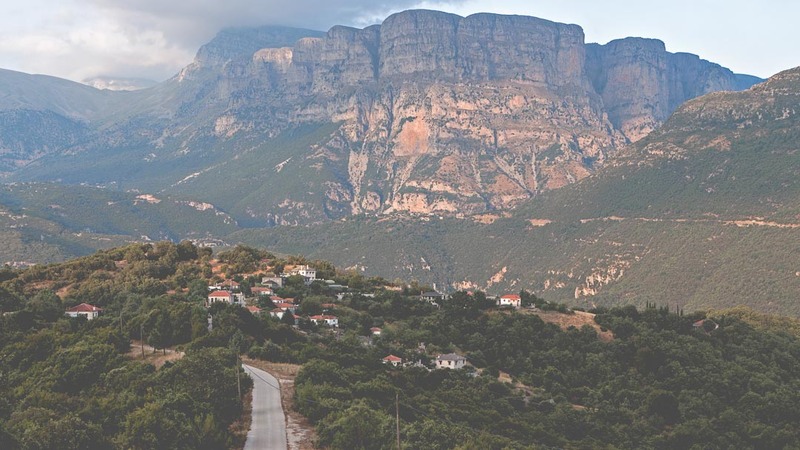 You will see natural wonders, such as the Vikos Gorge which is considered the 2nd deepest in the world. Or the limestone pinnacles of Meteora, a UNESCO World Heritage Site. You will find yourself under thick tree canopy, where the sun never touches the ground. 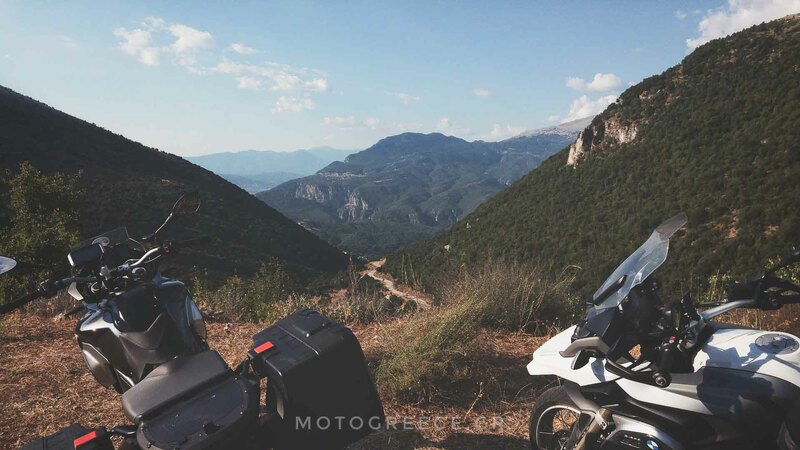 You will ride over the highest paved mountain pass of Greece, where you will think that you have been teleported to the Alps. About one third of this tour runs through regions that are commonly considered as the most wild, rugged and unspoiled of Greece. And then, you will spend a day relaxing in Lefkada, the island with it’s world known beaches, such as the “Porto Katsiki” or the “Egremni beach”. We have added some elements of popular & historic interest, such as the ancient site of Delphi and the monasteries at the location of Meteora. Last, but not least, you will have a chance to relax by rafting on Europe’s clearest river! 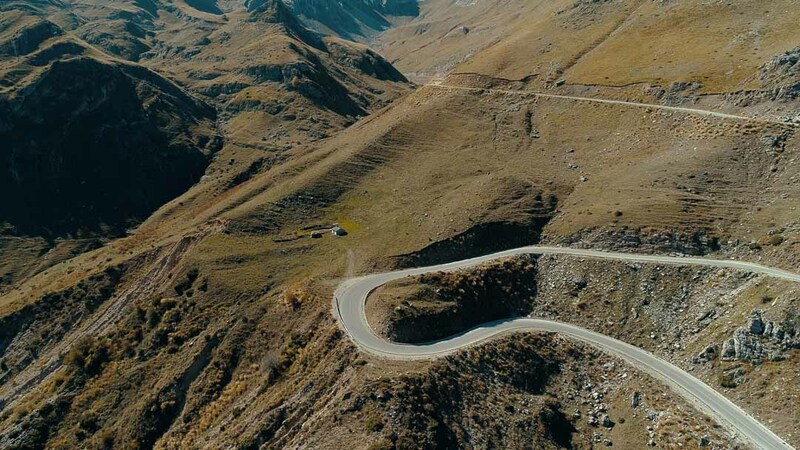 This tour, due to a) the extended diversity of the areas visited, b) the long distances, c) the remoteness of some areas and d) the narrow roads, is considered by most riders as “Advanced“. You will get tired, physically, but mentally and emotionally you will be elevated! P.S. 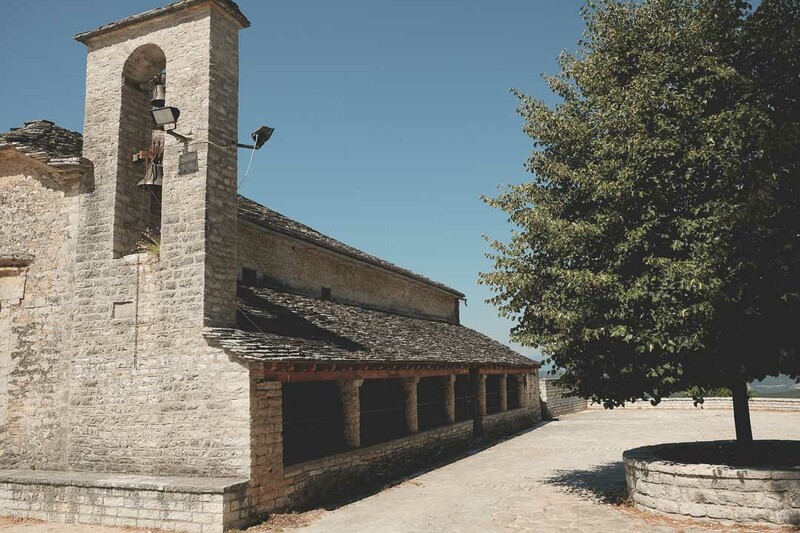 If you are intrigued by the places and the description but you don’t have 12 days to allocate, look in the Tours section of our website for a shorter version, the “Zagoria” tour. In total of 8 days we included a section of this tour. 12 days in total. 9 riding days, 1 rest/free day and 2 days accounted for your arrival to and departure from Greece. Aprox. 1,900 kilometers (~ 1,190 miles). The average daily distance is 210 kilometers. The longest day is 390 klms, the shortest is ~100. A couple of days with 6-8 hours on the saddle (depends on your experience level). Most days with average of 4-6 hours on the saddle. Boutique & traditional guesthouses, a mountain resort, and a luxury hotel. “Advanced” level for most riders. Please read here about how our tours are graded! 100% paved. 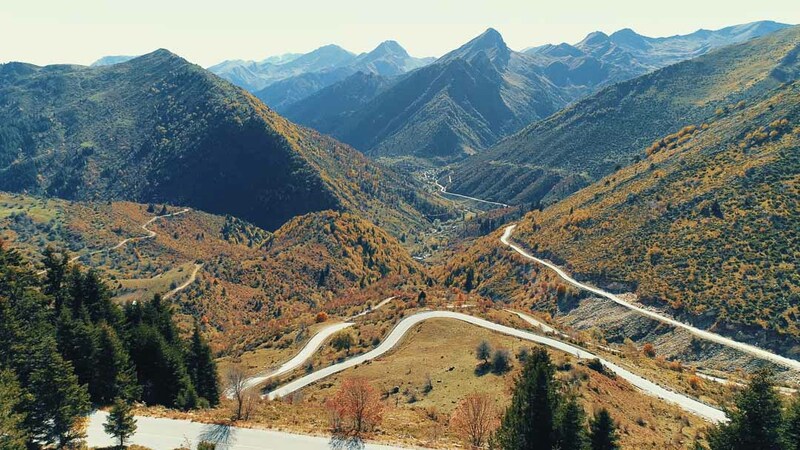 A large amount of this tour runs on “challenging” roads: narrow, secondary mountain routes with never-ending corners. Continuous steep hairpins are often present. 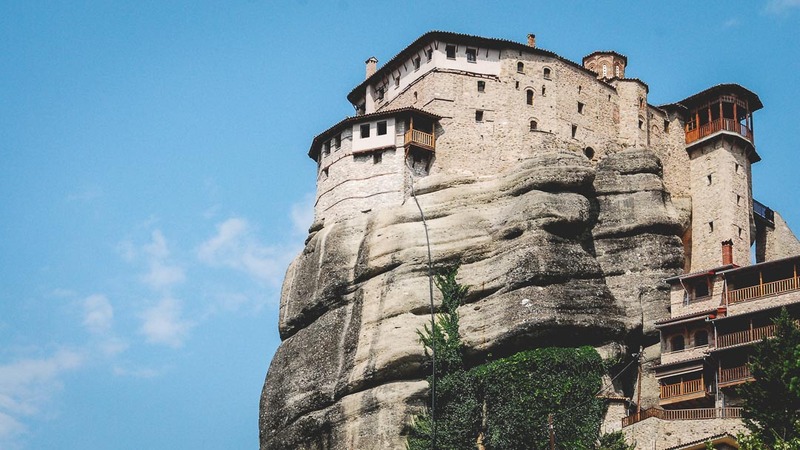 The monasteries of Meteora and the imposing limestone towers, a UNESCO world heritage site. 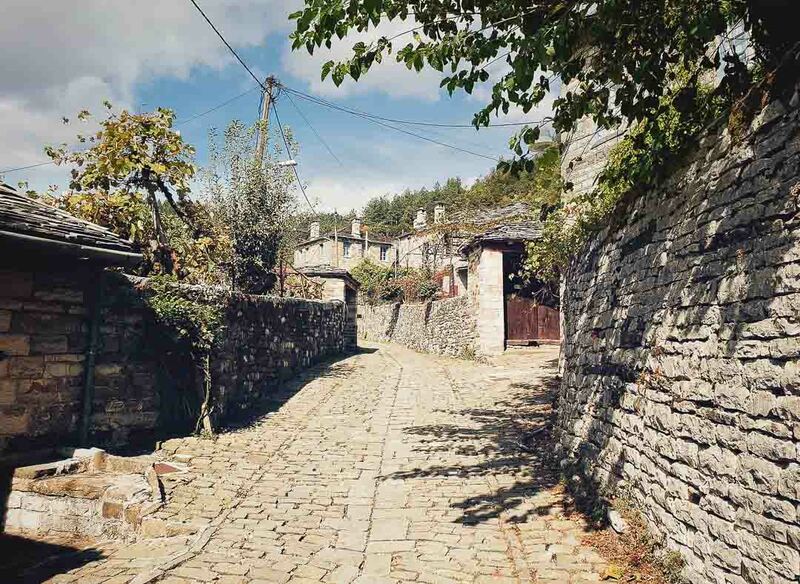 The villages of Zagori (also Zagoria or Zagorohoria) in the northwest. Traditional stone built settlements full of character and beautiful architecture. The clearest river of Europe, Voidomatis. The colors of the waters will enchant you! The villages of Tzoumerka built by stone in steep gorges and on edges of cliffs. The archeological site of Delfi with the Oracle of Apollo, one more UNESCO World Heritage site. The magnificent island of Lefkada, with the turquoise colored beaches. 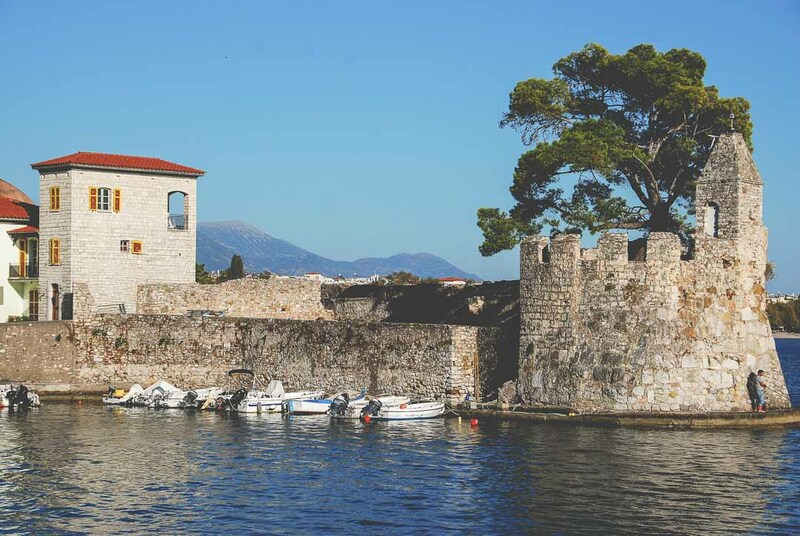 The medieval coastal castle of Nafpaktos. LET US TEASE YOU ! 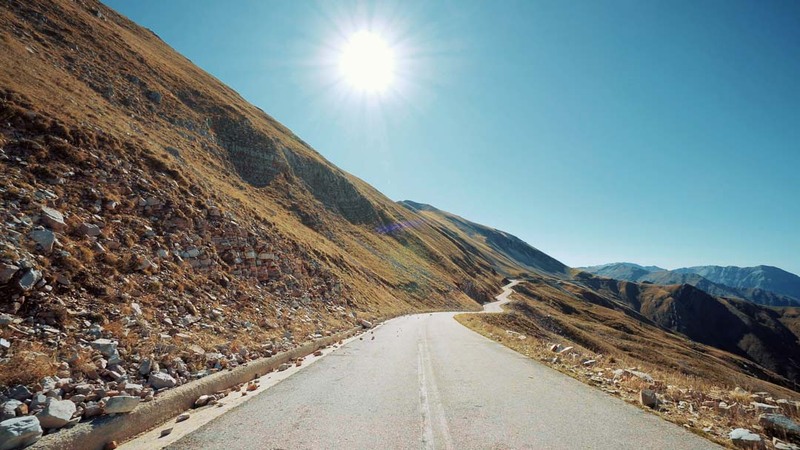 This tour will take us mostly to mountainous regions and secondary roads, where traffic is often absent. 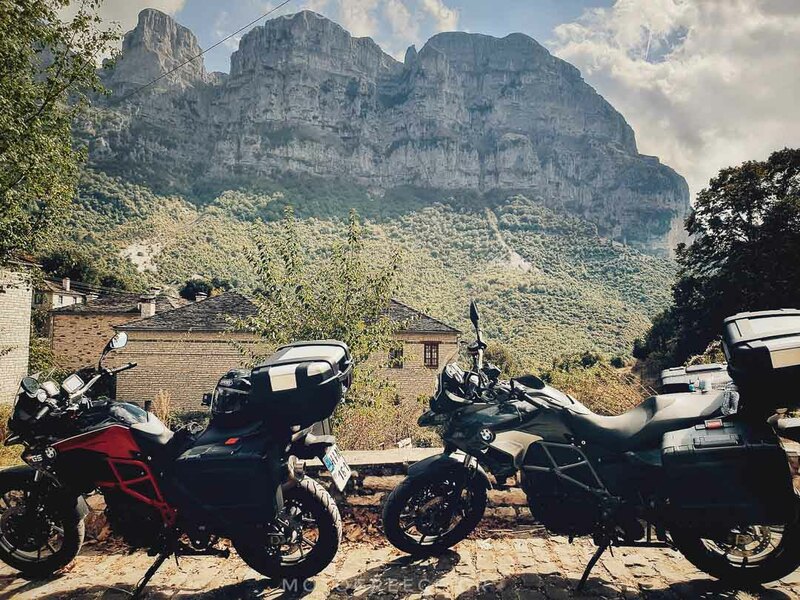 We have included the most scenic routes, with the most amazing vistas, those that are considered by the local riders’ communities as truly the best of Greece in terms of scenery and landscape. But this comes at a cost! A lot of stages of the tour run through continuous narrow winding roads, with little room to spare. 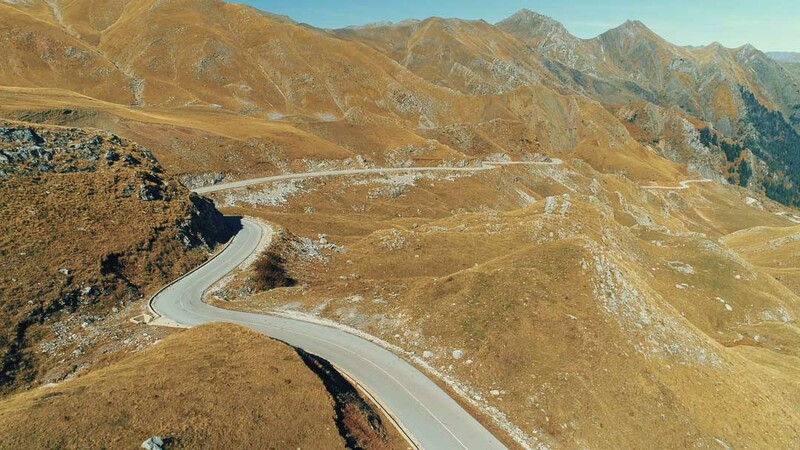 You will ride as much as 100 kilometers of such roads in one single take! 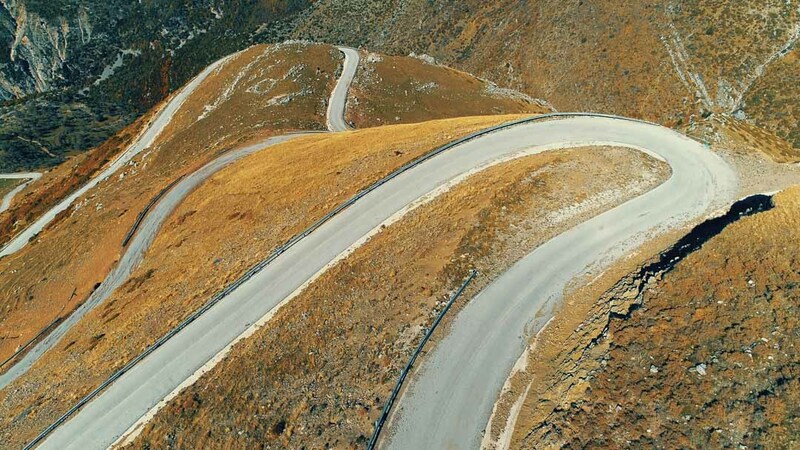 Successive ascending or descending tight switchbacks/ hairpins are often present. There are occasional rough sections, with potholes or scattered stones dropped from cliffs on the surface, especially at the most remote mountainous roads that we pass. 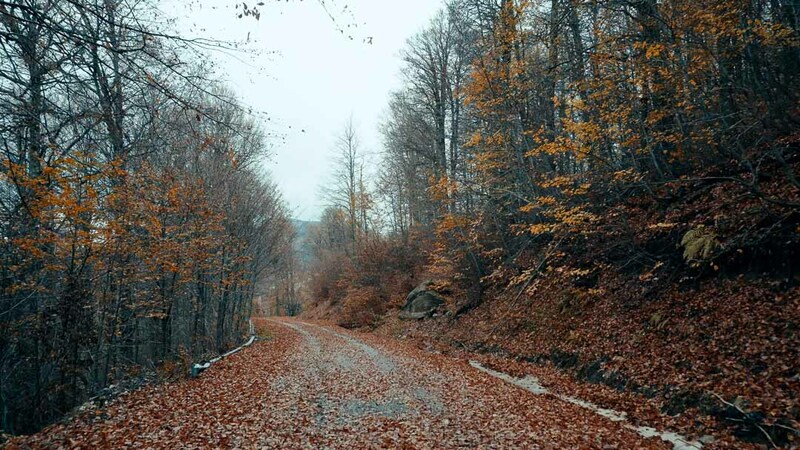 Also, on those remote roads, due to extreme weather conditions that might have preceded during the winter period, there might be damaged sections that are in a state of repair. This means we might encounter short stretches (i.e. 10-50 meters long each) with dirt or gravel. Day 1: Arrival to Athens. The group assembles and we leave busy Athens. Through country roads we take the first day relatively easy. We arrive in late afternoon to Delphi with plenty of time left to visit the historic sites of this place. Day 3: Thessaly & Meteora. 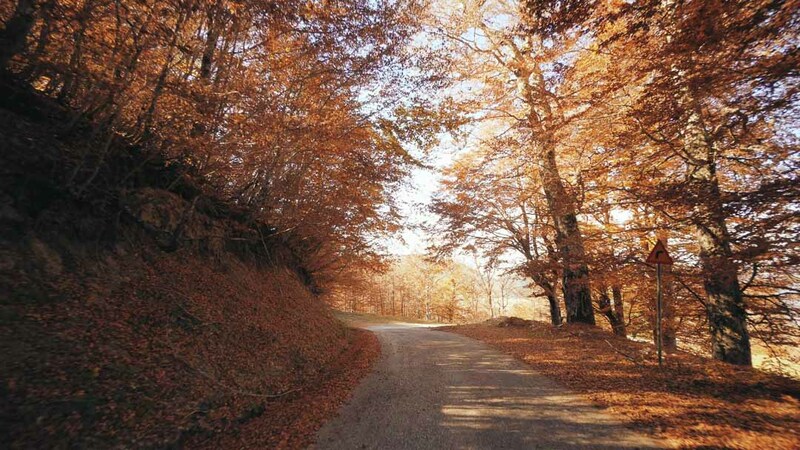 We ride through central Greece, amidst lush vegetation, natural springs and rushing rivers, on narrow winding roads. 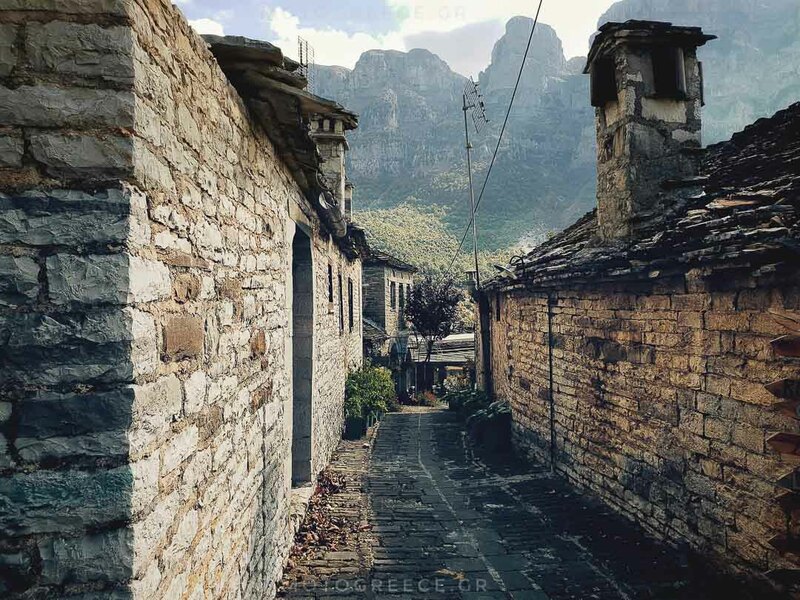 As we will be approaching the town of Kalambaka, the “gateway” to Meteora, you will be stunned by the dominant view of the massive detached stone pinnacles, 400 meters above the ground. We ascend to the top to gaze upon the vistas. 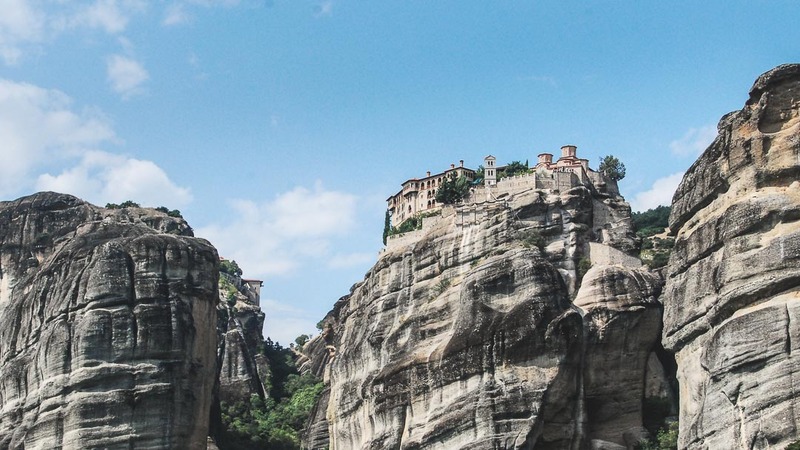 The Meteora is also a UNESCO World Heritage Site. 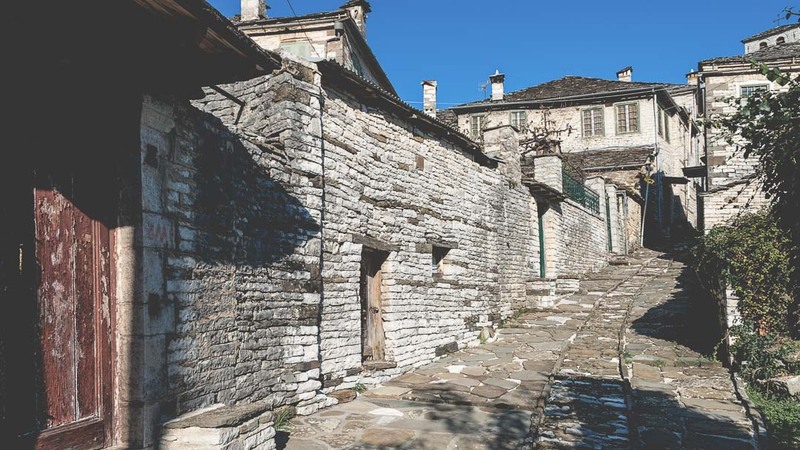 If you are feeling religious or just want to indulge to Byzantine history, pay a visit to one (or more) of the monasteries that are perched on the summits. 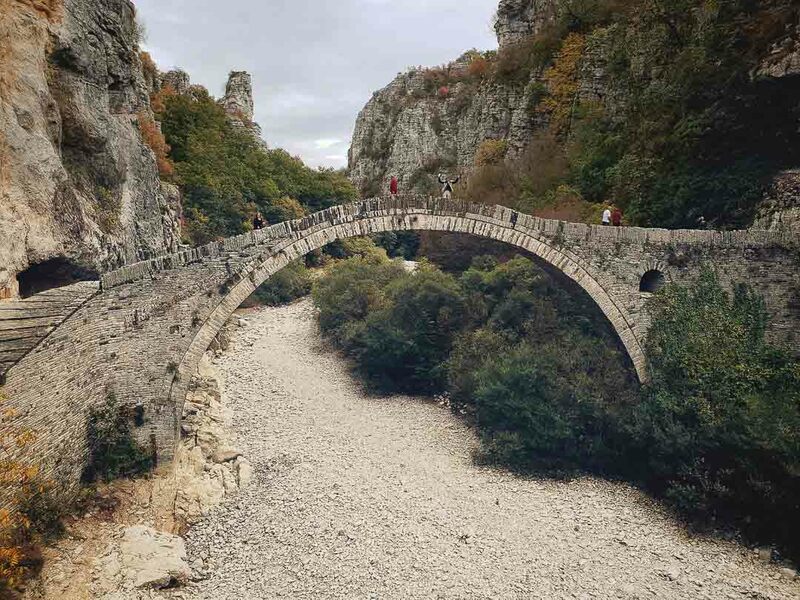 Day 4: Enter Zagoria ! 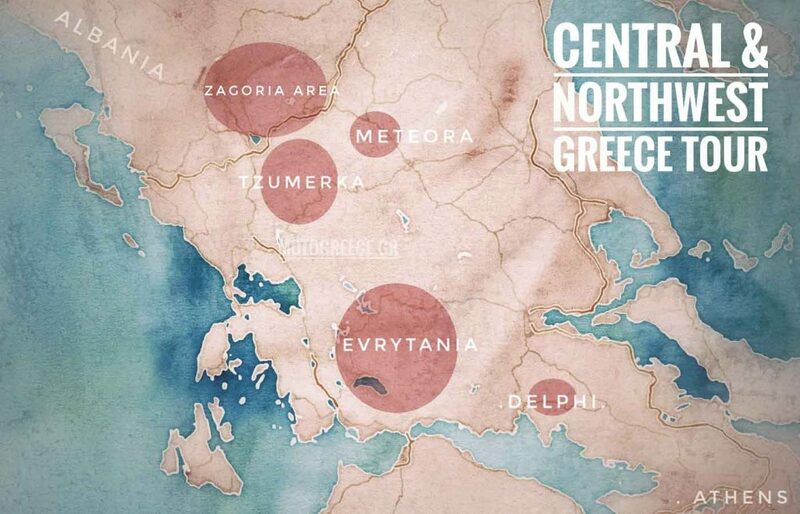 Today we enter the NW territories of Greece. 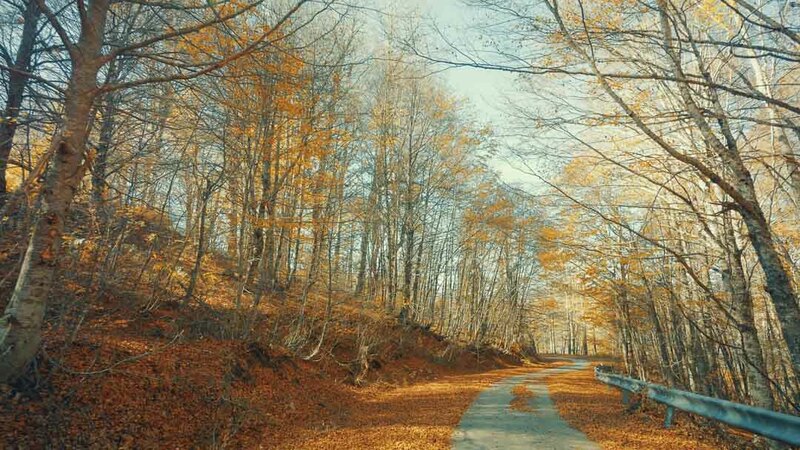 We ascend to the “Katara” Pass and not long after we reach the wider region of Zagoria. The route of the day from that point on, is on endless curves and corners, passing by alpine meadows. The first villages of the Zagoria appear in front of us. We reach our stone-built boutique hotel, at a tranquil site. Time for “meze” and “tsipouro” (local spirit)! After 4 days of intensive riding, today is time to take it easy! 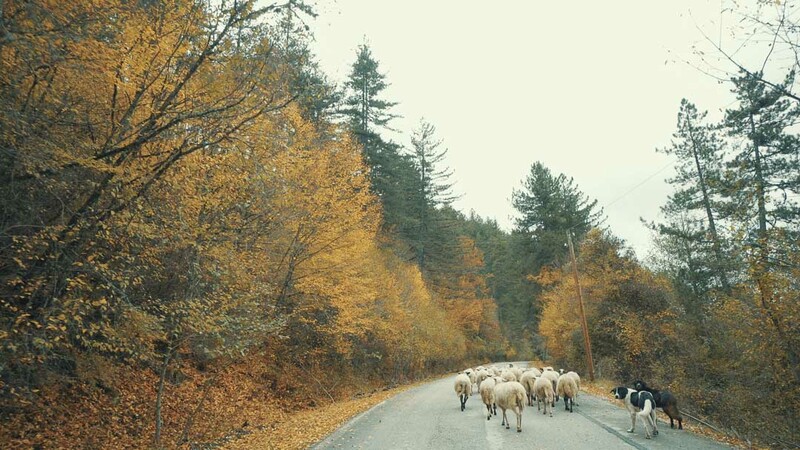 Few kilometers are in schedule, just to explore neighbouring villages of Zagoria. 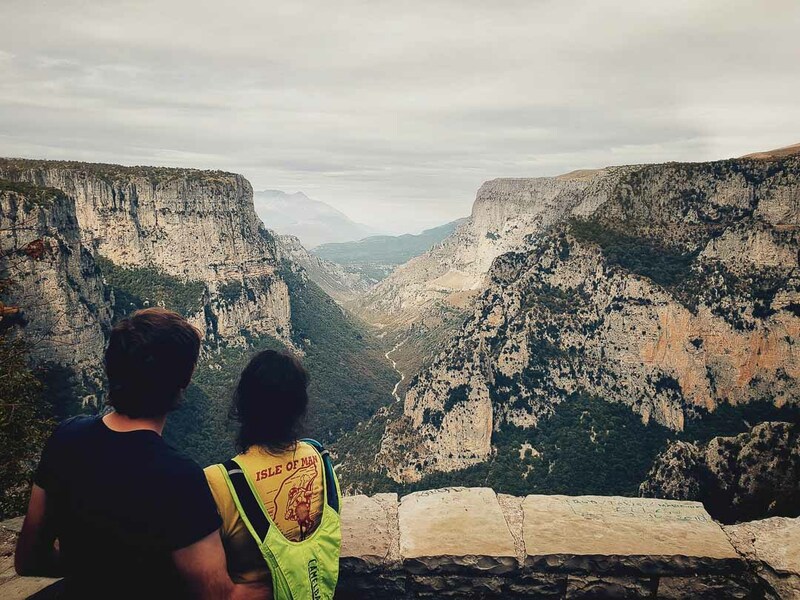 You will stand in 2 panorama locations to see the Vikos Gorge, the 2nd deepest in the world and admire nature! 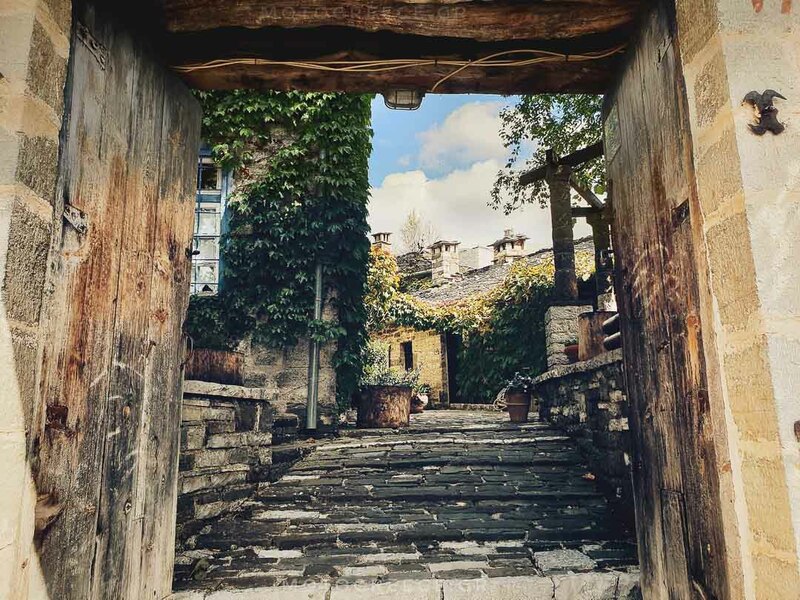 You will visit the twin villages of Megalo (Big) and Mikro (Little) Papingo located below the great limestone “Towers of Astraka” on the north side of the Vikos Gorge. There, at the village’s natural swimming pool you might want to have a dip and a break! If you are up to it, it will be time for some easy rafting in Voidomatis river, with the clearest waters in Europe. The activity lasts about 2 hours and is offered by professional rafting instructors who accompany you all the way. Day 7: enter Tzoumerka ! 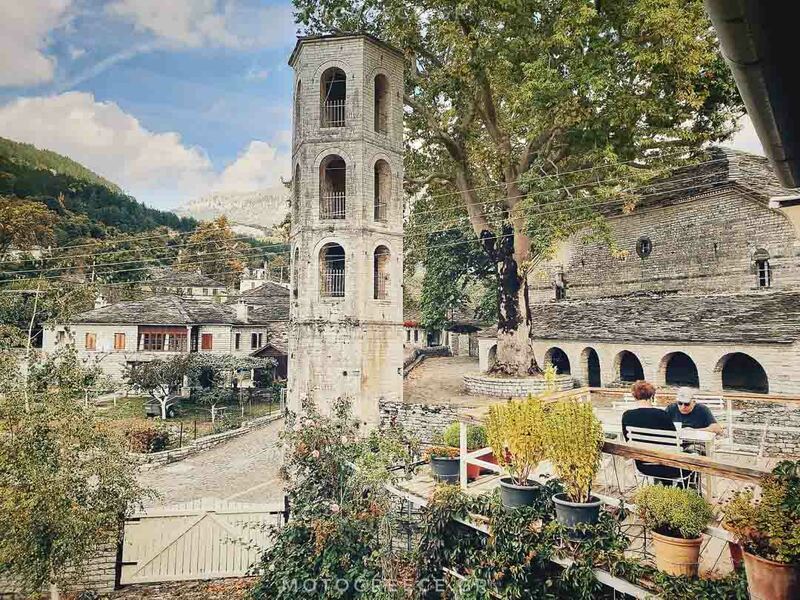 We leave the region of Zagori and have a stop-over in the city of Ioannina for a coffee on the shore of the lake. 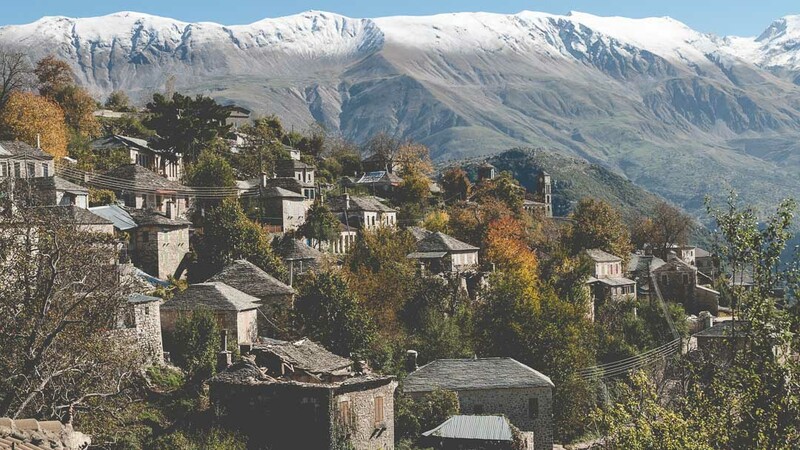 We approach Metsovo and then we enter the majestic Tzoumerka mountain region, the wildest and most remote mountainous area in the country that is passable by paved roads. 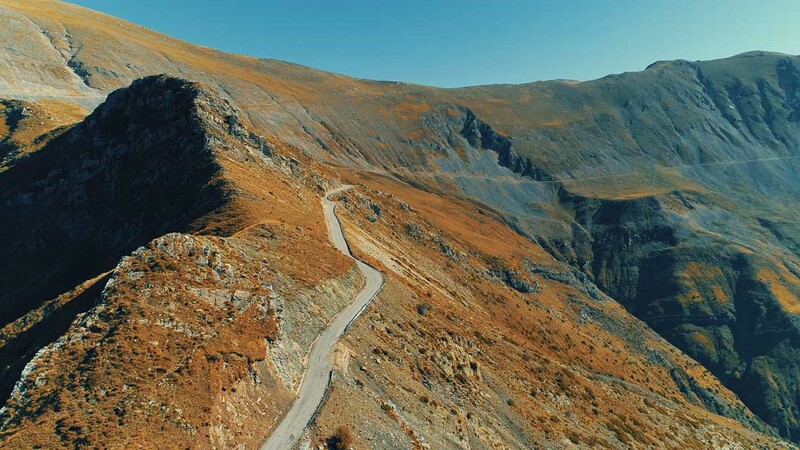 We ascend to the highest paved mountain pass of Greece at 2,000 meters altitude. 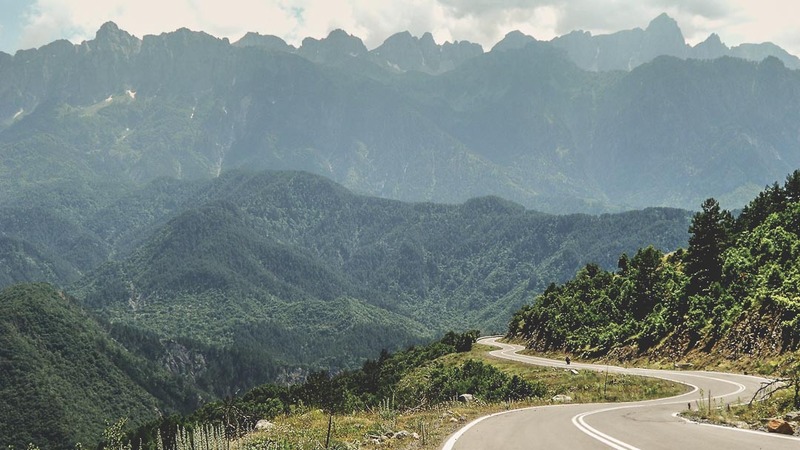 The descend offers breathtaking views until we reach our hotel, a luxury mountain resort at the heart of Tzoumerka mountain range. 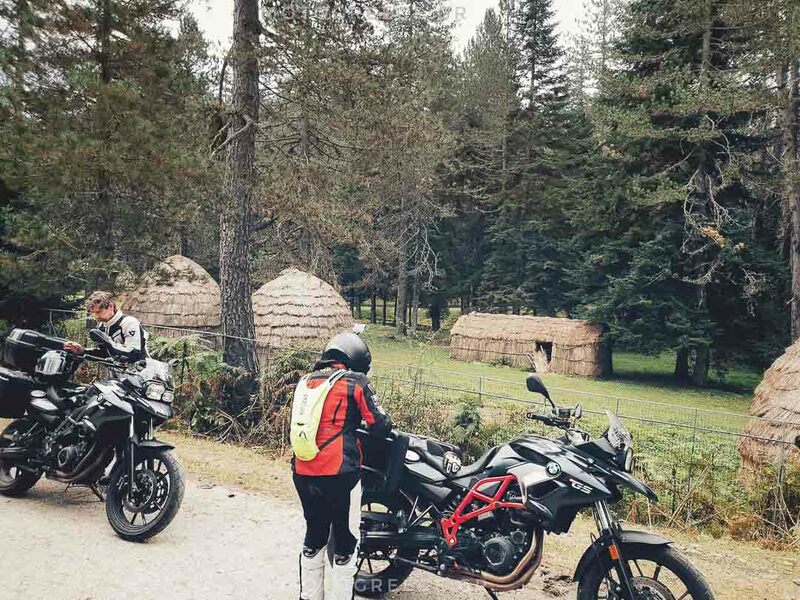 We continue riding through the Tzoumerka region. 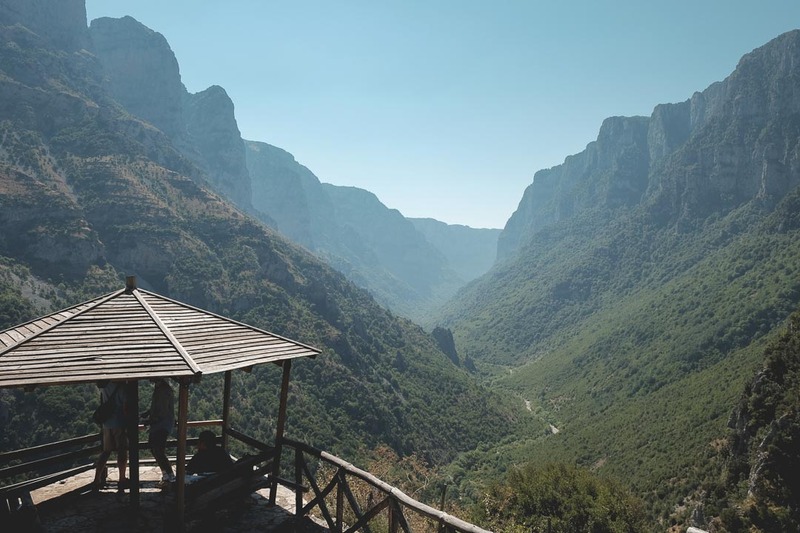 We go deep in the Kalarytiko gorge where the views are spectacular and the villages are built on top of cliffs. Exiting this beautiful area our ride gets smoother and much easier as we head to the plains of Arta and then on a relaxed easy-going pace we finish our day at the island of Lefkada, which is accessible by road, so no need to take a ferry here! Lefkada is a beach paradise. Probably you will have a hard time leaving this place behind! 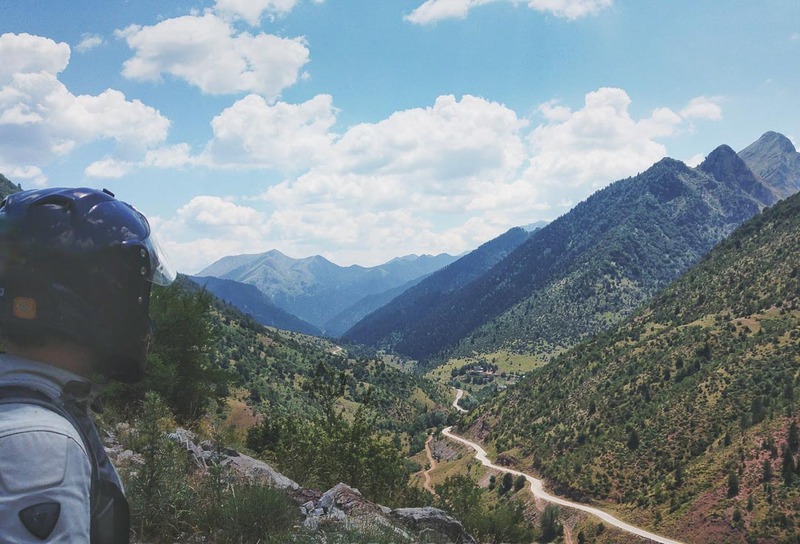 We head to Nafpakos for the day, but we do so by following the “long” route though the country side roads of Evritania provinces. Once again, gorges & lush scenic landscapes are on our way, making this a favorite ride. We follow the coastal road until Itea, from where we ride continue on secondary country roads all the way until Athens, but after we do a stop at a sea-side village for a final snack. At Athens, we renew our appointment for a few hours later, when we have a farewell diner late in the evening. We suggest that you make arranges for departure on day 11 and not on day 10, so that you will have an easy-going return to the end point of the tour. Outstanding payment: no later than 45 days prior to tour start. Minimum participation of 3 riders is required. For 2 riders or single private tour, the cost is higher. Please contact us for a quote. For a self-guided tour price quote, please contact us mentioning possible or required dates. 1 – 12 June : bookings closed ! 11 – 22 September, bookings closed ! – 8 diners, including 1 welcome diner in Athens. – Rental of BMW Motorcycle, with side panniers and top case. – Anything else not described as “included”. Tailor this tour to your needs! Your available days are less than 12? 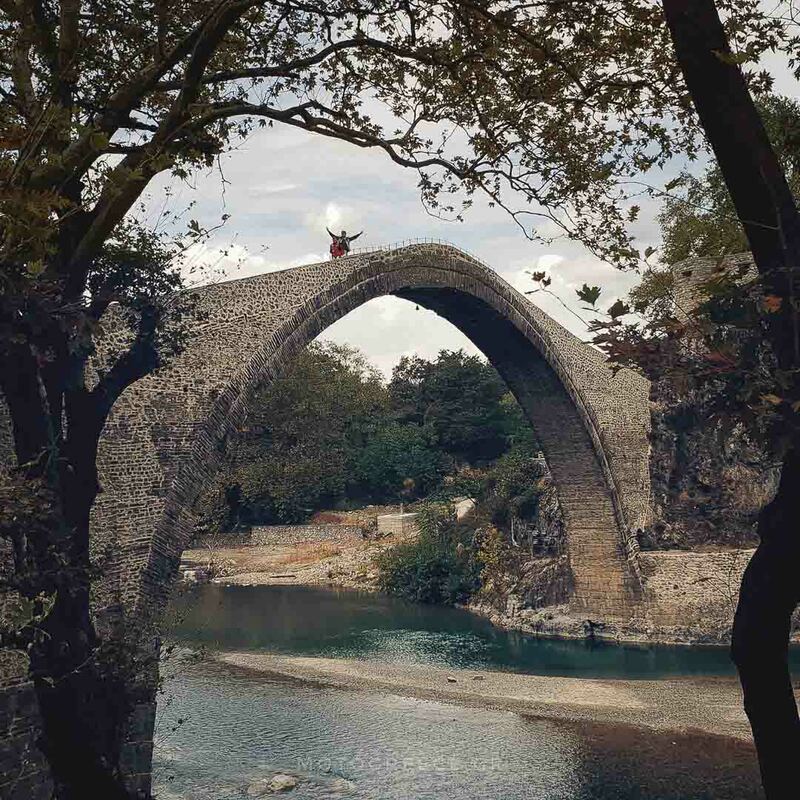 Have you seen our “Zagoria Tour“? It travels to some of the same locations for a total of 8 days. We can adjust the tour to fit your preferences. Add or remove days, see more destinations, or ask for different dates! Perhaps you feel that you don’t need the services of a support car and wish to do the tour without one to lower the cost? For these parameters or anything else you might want to change, contact us! Go back to our Tours Overview, or read the Tour Terms & Conditions, or check the Frequently Asked Questions. Subscribe to our newsletter to know about changes in this tour, offers, or new tour announcements!